Boxcutters, Jigger, Mixing-glass, Citrus Juicer, Strainer, Stirrer (long Spoon), Tablespoons, Large Martini Glass. In a pitcher add Vodka, Amaretto, Orange juice and Grenadine. Stir well to combine. Add Limonade and mix gently until combined. 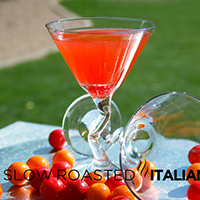 Add Maraschino Cherry to Martini Glass and pour drink over top.